ZTE Avid 4G: Specifications, features, review & price in U.S.A.
ZTE is a Chinese telecommunication equipment and Systems Company that provides cheap ICS Android CDMA phones for Metro PCS, the fifth largest mobile telecommunications network in U.S.A. Though Windows and Apple running smartphones, Android smartphones-all have flooded the market yet the demand for these continues to rise. Most people love to change their phones for newer technologies & features equipped smartphones. ZTE Avid 4G has dimensions of 124 mm height, 65.5 mm width and 11.9 mm thickness. It weighs 148.8 grams. It sports a TFT capacitive touchscreen with 256K colors and a 480 x 800 pixels display which has 223 pixels density with multi touch facility. This phone has 4 GB internal memory and 512 MB RAM. However, only 2.32 GB data can stored to internal memory. To store more data, it has a 32 GB external memory card. ZTE Avid 4G has 5 MP rear cameras with autofocus and LED flash facilities. It has a VGA front camera for video calling. This device supports Wi-Fi, Bluetooth and Micro USB port. Like the name suggests, it is a 4G smartphone. ZTE Avid 4G runs on Android Ice Cream Sandwich operating system and is powered by Dual Core 1.2 GHz processor. It supports GPS and Java facilities like all Android phones do but it has no radio. ZTE Avid 4G is available only in black color. A Li-Ion 1730 mAh battery which provides 260 hours standby time and 4 hours talk time is used for backup. The price of ZTE Avid 4G is estimated to be around $150 in U.S.A. The major drawbacks of this phone are no GSM and radio facilities. The main drawback of any CDMA device is that it cannot be used worldwide. The good thing is that users can download a lot of games and applications from Google Play. 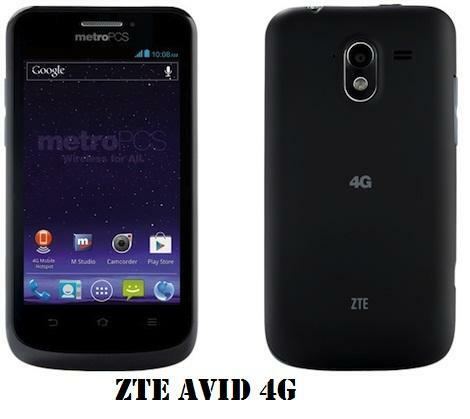 ZTE Anthem 4G is another Android smartphone developed by ZTE for Metro PCS CDMA users. It is larger in size & heavier than ZTE Avid 4G. Display facilities are almost the same except the ppi pixel density of 217. Memory and camera features are almost same. Main drawback of ZTE Anthem 4G is that it runs on Android 2.3 Gingerbread operating system which is the oldest Android operating system and does not support many applications which ZTE Avid 4G do. Like ZTE Avid 4G, it is powered by Qualcomm Snapdragon and 1.2 GHz Dual Core processor. It has Li-Ion 1780 mAh battery which is better than Li-Ion 1730 mAh battery is used in ZTE Avid. ZTE Anthem 4G provides more standby and talk time than ZTE Avid 4G does. Like ZTE Avid 4G, it is available only in black color. ZTE Anthem 4G is costlier than ZTE Avid 4G. Anthem 4G has already hit the stores on September, 2012 and its price in U.S.A is estimated to be around $200. ZTE Grand X IN and Blade III smartphones have been unveiled in Greece after making its entry in Austria, Hungry and Poland. Read the reviews of ZTE Grand X IN and ZTE Blade III Android Smartphones in this article. ZTE recently announced that they will be launching the Grand S2 smartphone in the Indian market very soon. At a conference held in Delhi recently, Techulator team checked out the phone, its specifications and the features it offers.